Online Gaming: New World of Awesome or New World of Douchebaggery? Online gaming has grown a lot since... well... since the concept even started. It has grown from just plain game sites to first-person shooters. In the beginning, it was friendly to the point where we say hello to each other. Now it grows to the point from saying hello, where you get a "F*** off." It's hard finding gaming communities, clans, or guilds that are decent with respect and maturity. We play online games to pretend what we want to be while having fun. So what makes a game good? Not just the gameplay... but the community too. So what happens when a community is terrible? There are less active players, because who wants to come online and be insulted everytime? No one does. Whether it is in text chat or voice chat, you're either gonna get harassed or talked nicely to. It is almost like a 50/50 chance with new people. What delves us into the depths of videogaming? What makes us attach to video games? What makes us who we are from video games? All that aside, video games do play a role in society. As a child or a person not into technical stuff, when you get in video gaming, it is like a whole new world opened. Either playing as some plumber who likes to eat mushrooms, or an elf clad in green bringing peace to the kingdom, or unraveling mysteries of crystals, or becoming a boy in a baseball cap that wields a bat to save the world. I thought I'd come on and post about my new hobby of sorts, beading. Not just any beading, but video game pixel art beading! I just started at it actually a few days ago, but I got inspired by various creations online. 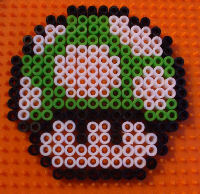 If you go over to google image search and punch in "perler" you'll see all sorts of creations by other pixel beaders. Perler is one of the brands of beads used to create these artworks. It's not hard to do, just a bit time consuming, but it can be a lot of fun and gets me away from the computer for awhile. You pretty much have a ton of these little coloured beads and a pegboard (or a few, as some projects can get pretty big) and you place the beads to create pictures. When you are finished, you can use a household iron to make the beads melt, and form a solid piece of art. People turn these things into necklaces, keychains, fridge magnets, or even just put them on a shelf for display. 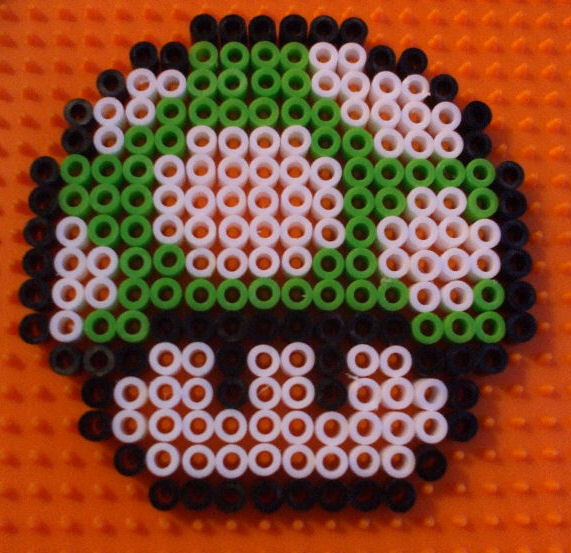 So far I haven't made much yet, but I did make the 1-Up mushroom in this article! I hope to create various projects and maybe make a gallery on here to show off my creations. I welcome any suggestions on what sort of projects I should do! My first ones will probably be based on Mario, Final Fantasy and Lufia. (I just love the Lufia series!) Anyways, I just wanted to come on here and say that yes, we are alive... just occupied! 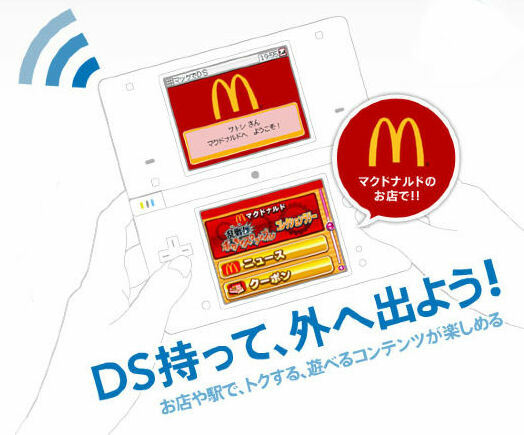 It sounds crazy, but McDonald's restaurants in Japan believe using the Nintendo DS as an employee training tool will cut training time by half when compared to conventional methods. They are currently developing a proprietary software for the DS known as "eSmart". New part-time employees will be trained using software. Nintendo already has strong ties to McDonald's over in Japan by offering the Nintendo Zone service in its restaurants, which allows customers to grab game demos, information and other exclusive content directly to their handhelds. I guess the employees wanted in on the action too! McDonald's plans to place two DS consoles at each of its locations in Japan, which totals up to about 7,400 new consoles. Excluding the software development, they estimate the program will cost about 200 million yen ($2.2 million USD). I wonder which edition of the DS they will be using (DS/DSi/DSi XL), and if the systems will have a cool custom skin. Probably not. I hope we get a peek at the software once its ready, I am curious what it will teach and how this will be more effective then 'traditional' training. This is just a small list of the items they have on sale right now, browse around their site to get a full listing of items available! I'm not sure how long this sale is on, so grab 'em while they last. Did anyone visit the Penny Arcade Expo? Are you feeling a bit sick when you returned? Do you have a high fever, nausea, and fatigue? If so, you may have a case of the swine flu. Mike Krahulik warned everyone who attented the Penny Arcade Expo: "PLEASE if you feel symptoms (fever, etc) call your doctor." We have a list of potentially infected flights and trains leaving the Expo. 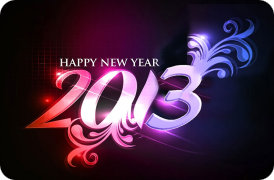 Check after the break for a full list, and more information. Also, for more general information about the swine flu (H1N1 virus), check out this link. Over the weekend I went to the first GottaCon, in Victoria BC, Canada. First off, I might be a bit biased as I was a volunteer there as well. Walking in the door, you are greeted by the standard registration desk. As conventions go, this one wasn't pricey, $15 for Friday, $20 for Saturday, and $15 for Sunday or you could get a weekend pass for $40. There were a total of 22 events that ran from Friday at 6pm until Sunday at 7pm. The most you could hope to be in is about 11, depending if you wanted to sleep. The Vendors there included many local shops including Skyhaven Games (main sponsor), PlayStation, Under Fire Media who was promoting their new TCG Ethos, DTI Computers, Dragon Impact (Got to have those swords), Knocturnal Gaming, among others.